"The Syrian-Russian joint action and high-level coordination in all domains, mainly militarily and politically, have been among the key factors that enhanced Syria's steadfastness in the face of terrorism and that contributed to achieving successive victories against Daesh and Jabhat al-Nusra terror organizations and other terrorist groups. Some countries and forces fight terrorism only in the statements of their officials while they actually support it and keep protecting terrorists in some areas; such policies have caused many civilian casualties and contributed to expanding terrorism to other areas." H.E. President Bashar Al-Assad upon receiving the visiting Russian Defense Minister, Sergei Shoigu, March 19, 2019. "The pressure and hostile policies adopted by some western countries against Russia after every victory achieved against terrorists in Syria is a clear evidence that the terrorist war waged on the Syrian people is no more confined to Syria only; Which deem it necessary to strengthen the Syrian-Russian relations in the this critical era of the region's history." H.E. President Bashar Al-Assad upon receiving the Russian United Russia Party, led by MP Dmitry Sablin, January 17, 2019.
" the efforts exerted by Syria's allied and friendly countries, particularly Iran and Russia, as to stop the interferences of some countries from the West in the political track, and as to establish firmly a political process led by the Syrians away from whatever foreign interference are indeed pivotal.."
H.E. President Bashar Al-Assad upon receiving the visiting senior Assistant of Iran's Foreign Minister for political Affairs, Hussein Jabri Ansari, December 16, 2018. H.E. President Al-Assad upon receiving the Russian Government delegation, led by Yury Borisov, Russia's Deputy Prime Minister and Head of the Russian side in the Russian-Syrian Inter-Governmental Commission on Trade, Economic, Scientific and Technical Cooperation, December 13, 2018. On September 24, 2018, Presidents Bashar Al-Assad and Vladimir Putin discussed in a phone conversation today the political developments in Syria and Idlib Agreement and the know-how of its implementation. President Assad expressed his heart-felt condolences to President Putin and the Russian People over the martyrdom of the hero Russian military soldiers, who were in their noble mission fighting terrorism in Syria before their IL 20 military plane were downed. President Putin held during the conversation Israel the responsibility for downing the plane and informed President Assad that Russia is to develop the Syrian Air Defense System and would deliver advanced S-300 anti-aircraft System to Syria. "On behalf of the Syrian people and on my own behalf, I expressed my deep condolences to President Putin, the Russian people and the families of victims of the Il-20 plane crash that caused the martyrdom of the Russian heroes who were doing their noble duties along with their colleagues from the Russian military forces in the fight against terrorism in Syria. This tragic incident is the result of the smugness and arrogance of the Israeli entity which always uses most obscene means to achieve its malicious goals and to carry out its aggression against the region. "we are confident that such painful acts would not prevent you and us from carrying on the fight against terrorism." President Assad's Condolences cable to President Putin, September 19, 2018.
" For many different reasons. Syria is part of the group of countries that are considered as independent: Syria, Iran, North Korea, and now Russia as an independent country. So, the West doesn’t accept any independent position. America doesn’t accept any European independent position. And that’s why you have a problem in Russia with the US, because you wanted to be independent, and they don’t accept you, even if you are a great power or not, you cannot be independent." From President Assad's Russian NTV Channel Interview, June 24, 2018. "Friendship is a long-term issue between Syria and Russia, for six decades, but we signed the military treaty for more than four decades. So, we have two expectations: the first one, Syria and Russia have an interest in fighting and defeating terrorism, in Syria, in Russia, anywhere in the world. So, this is the first expectation and goal. The second one is the long-term one. Russia is very important for the global balance that we’ve lost since the collapse of the Soviet Union. So, having Russia being here militarily and politically, in Syria and in the Middle East and in the rest of the world is very important for the balance. It’s not only important for Russia itself and for the other great powers; it’s very important for smaller countries like Syria to have this balance. So, that’s what we expect from Russia on both levels: fighting terrorism and having global balance." "This is first. Second, you’re right to feel this worry, even in Russia, not because you lost lives in Syria; because you have the same terrorism in Russia. How I look at it? If those terrorists succeeded in Russia, I will be in danger; they’re going to come to Syria and to other countries, and vice versa. So, you’ve been defending the Syrians, but you’ve been defending the Russians. So, you paid the price in Syria in defending the Syrians, but you are defending the Russians as well, because terrorism has no political borders; for them it’s one battlefield from Russia to Syria, maybe to Indonesia, and maybe to Morocco on the Atlantic Ocean." "You know that military action and military considerations are part of political considerations. Consequently, a statement, even if it is of a military nature, carries at the same time political messages. So, why did the Russians say that they want to send or not send? This is a statement that the Russians should be asked about because it might be part of their political tactics. As to the military aspect of the statement, which concerns Syria, it’s not our custom to talk about the weapon which will be delivered or not delivered. The evidence was that the weapons used in response to the last two aggressions, the tripartite aggression and after that the Israeli aggression, were not announced by Syria. We traditionally do not announce cases of a technical military nature." " If we talk first about the Syrian-Iranian part, for 40 years, and in the different conditions that the Middle East region has gone through, this alliance remained solid. So, there is no reason to say that it is temporary or otherwise. The new element in the war on Syria is the Russian element, and that’s why this tripartite alliance came into existence. Our relationship with Russia is now about seven decades old. Despite the fluctuations and the fall of the Soviet Union, the rule of President Yeltsin, and the deterioration of these relations to a large degree for us, it has never reached the stage of reversing this relationship with Syria. Russia continued to deal with Syria as a friendly state, and we have imported everything from Russia, including weapons, during the different stages of the sanctions imposed on Syria. It is not in the nature of the Russians to build temporary or self-serving alliances or to sell out on relations in order to get deals done. The relationship is definitely a strategic one, but the political statements allowed for these speculations." "These statements also aim at sending messages in different directions. Maybe, sometimes the language or the choice of particular terminology might not be helpful and might take the statement in a different direction at odds with the content of the statement. This happens from time to time. However, these statements shouldn’t be taken out of context: the Russian view of the relationship with Iran is a strategic one. As for Syria, the Russians do not interfere in Syrian affairs. If they have a certain opinion, they raise it with us and say that in the end, the decision is that of the Syrian leadership and the Syrian people. This is a constant principle for Russia. Therefore, the alliance is a strategic one, and if there are differences, such differences happen within the Syrian state, and you see differences within the Iranian state and within the Russian state. It is natural for us to differ on daily tactical details, for why conduct a dialogue if we agree on everything? We meet extensively in order to reach agreement." "Of course. This is dictated by reality, interest, and international changes that make it necessary for this alliance to be consolidated. As long as the other axis supports terrorism, and as long as we, together with Iran and Russia, feel the danger of terrorism, not only in Syria, but also on all these countries and on the whole world, and as long as Syria, Iran, and Russia realize the importance of abiding by international law, these facts make the existence of this alliance necessary." "This happened as far as the Russians are concerned. In the beginning, Russian support, like Iranian support, was different from what it is today. The support for terrorism has developed internationally and globally when the Syrian Army confronted those terrorists, and with that Russian and Iranian military presence developed. At a certain stage, we found – with the Russians of course – that the existence of air bases was necessary to provide air support to the Syrian Army. And now, if we find, in cooperation, coordination, or dialogue with the Iranians, that there is a need for Iranian military bases, we will not hesitate. But now, Iranian support in its present form is good and effective." "Russia never coordinated with anyone against Syria, either politically or militarily, and that’s contradiction; how could they help the Syrian Army advancing and at the same time work with our enemies in order to destroy our army?" From President Assad's Mail On Sunday Interview, June 10, 2018.
" In reality, we were close to have direct conflict between the Russian forces and the American forces, and fortunately, it has been avoided, not by the wisdom of the American leadership, but by the wisdom of the Russian leadership, because it is not in the interest of anyone, anyone in this world, and first of all the Syrians, to have this conflict. We need the Russian support, but we need at the same time to avoid the American foolishness in order to be able to stabilize our country." President Assad during his meeting with the visiting Russian President Special Envoy on Syria, Alexander Lavrentiev, and the accompanying delegation, May 23, 2018. President Bashar Al-Assad and President Vladimir Putin in a summit meeting at Sochi, May 17, 2018. 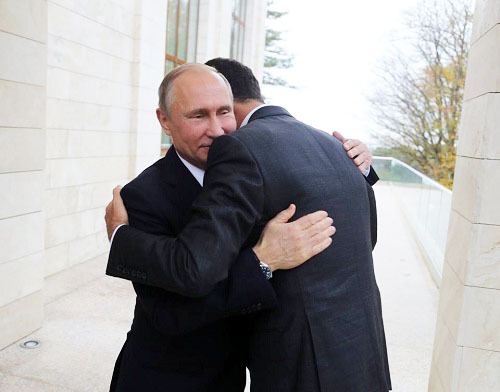 President Assad thanked President Putin and the Government of Russia for their stances throughout the crisis and for their humanitarian assistance to the Syrians who were forced because of the terrorists to move to other places in the country. "No, for one reason: because fortunately, you have a wise leadership in Russia, and they know that the agenda of the deep state in the United States is to create a conflict. Since the campaign of Trump, the main agenda was against Russia, create a conflict with Russia, humiliate Russia, undermine Russia, and so on. And we’re still in the same process under different titles or by different means. Because of the wisdom of the Russians, we can avoid this. Maybe it’s not a full-blown third world war, but it is a world war, maybe in a different way, not like the second and the first, maybe it’s not nuclear, but it’s definitely not a cold war; it’s something more than a cold war, less than a full-blown war. And I hope we don’t see any direct conflict between these super powers, because this is where things are going to be out of control for the rest of the world." From President Assad's interview with the Greek Kathimerini Newspaper, May 10, 2018. "…the tripartite missile aggression by the United States , Britain and France on Syria was accompanied by a misinformation campaign at the Security Council by the same countries against Russia and Syria. the aggression and misinformation campaign once again prove that the Syria and Russia are in the same battle not only against terrorism but also to protect international law which is based on respecting the sovereignty of countries and the will of peoples." H.E. President Assad during his meeting with a Russian delegation representing “United Russia”, the ruling party in Russia, April 15, 2018. H.E. President Assad in a congratulatory message to President Putin on winning the country’s presidential elections, March 19, 2018. “Under your leadership, the Russian Federation has stood against terrorism in words and deeds and it has fought, along with the Syrian army, against takfiri terrorists in the entire Syrian territories; this Russian contribution has rid many areas in the world from this plague which would have been expanded in the world without the role played by Russia in this respect." "President Putin is known of his honest stances which contain no hypocrisy or ambiguity. Russia's stances at international gatherings do reflect the pulse of the Russian people and that of all peoples who seek attaining justice among countries of the world on the basis of equal dignity." "The Syrians are determined to pursue their fight against terrorism in cooperation with the friendly countries, on top of them is cooperation with Iran and Russia which would also pave the way for achieving a political solution decided by the Syrians themselves,"
From President Assad's statements during his meeting with the Russian President's Special Envoy for Syria, Alexander Lavrentiev and the accompanying delegation, January 11, 2018. "The Russian support for the Syrian people in confrontation of the terrorist war imposed on them over the past years has contributed to boosting the historical ties between the two friendly countries." "The standing Syrian-Russian relations stand for more 6 decades with focus on the political aspect, and the military aspect given the ongoing war on terrorism, and the focus on the economic aspect is now on given the improvements in the security situation and the Syrian Economy moves." H.E. President Assad, December 18, 2017. "The Russian delegation current visit as an opportunity as to activate the standing projects of Russian investments in Syria." "The continued victories against terrorism in Syria create the appropriate conditions as to accelerate the rebuilding process of what terrorism has destroyed in many places of the regions in Syria, opening wide economic prospects and opportunities for further cooperation between Syria and Russia." "Russia is naturally an important partner for Syria in rebuilding in all sectors, given the standing historic relations and the honorable stances of Russia in confronting the war of terrorism against Syria." H.E. President Bashar Al-Assad during his meeting at Khmeimim Airbase with H.E. President President Vladimir Putin of Russia, December 11, 2017. "This blood watered the Syrian territory as a proof to be stronger than terrorism and its mercenaries. The memory of the martyrs of the two hero armies and their sacrifices will ever remain as the lighthouse for the coming generations." "The achievements that have taken place are very significant, very important for us. The theme of our meeting, the destruction of Daesh fighters, is very important for the whole world. We coped with this. On behalf of the whole people of the Syrian Arab Republic, I express my deep gratitude for the role your armed forces played. The victories that have been achieved have affected not only our state, but also neighboring countries,"
"The coming generations who are to read about the ongoing war on terrorism will never draw lines between a Syrian Martyr and a Russian Martyr,"
"President Putin's visit to Syria is an opportunity for discussing the second phase in fighting terrorism and for discussions about the political process in Syria. The big accomplishments in the fighting against terrorism opened the door wide before the activation of the political work and for finding a peaceful solution that would stop the bloodletting of the Syrians and restore safety to Syria,"
"The Russian military operation in support of the Syrian Arab Army’s war against terrorism has achieved important and significant results on various levels, mainly the political, humanitarian, and political ones." H.E. President Assad's comments during Sochi Summit with H.E. President Putin, November 21, 2017. "Victories being achieved by the Syrian Arab Army on terrorism with the help of friendly countries, especially Russia, and the restoration of security and stability to several liberated areas have paved the way for speeding up the economic wheel and for the start of reconstruction in the country. That it is normal for countries which supported the Syrian people in their war against terrorism as to have priority in participation in Syria’s reconstruction process"
H.E. President Assad to a Russian government delegation comprising directors and representatives of big Russian companies led by Russia’s Deputy Minister of Energy Kiril Molodtsov, October 2, 2017. “With the utmost happiness and pride, today I visit Hmeimim Military Base and meet the heroic fighters and pilots who came from the friendly Russian Federation to Syria as to contribute altogether with their Syrian brethren, the heroes of the Syrian Arab Army, to defending righteousness, justice, rights of peoples that are recognized by international laws and human morals, and as to join the Syrian people in defending their homeland's unity, sovereignty, resistance and in fighting against the terrorists who came from all over the world." From President Assad's written word in Hmeimim Military Airbase Note, June 27, 2017. "There is great cooperation with Russia and China in terms of political action or political positions. Viewpoints are similar, and there is cooperation in the Security Council. As you know, the United States and its allies have tried several times to use the Security Council in order to legitimize the role of the terrorists in Syria and to legitimize their role in the illegitimate and aggressive intervention in Syria. That’s why Russia and China stood together, and China’s role, with the Russian role, was essential in this regard." "Neither Russia, nor Iran, nor any friendly state can support an individual at the expense of the people. This is impossible. If he is killing the people, how come the people support him? This is the contradictory Western narrative; and that’s why we shouldn’t waste our time on Western narratives because they have been full of lies throughout history, and not something new." " In this situation, I mean our war, Russia looks at this war as more than Syrian war, and more than Syrian-Russian war. I think it’s the war of every country that wants to protect its citizens from the terrorists. So, when Russia supports our army, it not only protects the Syrian citizens, it also protects the Russian citizens, and I think the European and others. So, for them they don’t look at it as commercial war like the Americans; when they launch a war they calculated how much jobs can you create out of this war. They look at it as a war that needs to protect their citizens, our citizens, other citizens, the position of Russia, the balance, the political balance, the military balance around the world, as a great country. So, in that regard, you don’t look at the armaments as how much do they cost or how much do they bring as benefit or profit." "Actually, the Russian air forces were very effective and efficient during the last year and a half, little bit more, in supporting the Syrian Army, and everybody knows that since that support started in 2015, the balance has changed, and we could recapture Palmyra and Aleppo and many other areas, and we could defend Hama recently; it was a very huge and well-organized attack, but we could repel it. So, that support was very efficient, and of course, we shouldn’t forget the efficient support of the Iranians on the ground; they did not send troops, but with their officers, with their advisors, they played a very important role. So, I don’t think now there is a need for ground troops. Sometimes when there is intense attack on different fronts, as you mentioned, north, east, south, and in the middle, the Russian missiles attack from the sea. The Russian strategic bomber came from Russia to attack in Syria. So, the military support, the Russian military support is not limited to their base in Syria. Actually, they are aware about what the need of the fight; you have this fluctuation, but you don’t need troops on the ground till that moment. Maybe in the future if our enemies and their supporters, their terrorists, the proxies, change their strategy and bring more terrorists from around the world, and you have full armies of terrorists at that time, it could be needed, but at this moment, I don’t think it’s needed. What’s been done is good and enough." "We have our laws regarding how to make contracts with the different companies. We already started with some of the companies after his visit, especially as the Western companies left Syria, not because of the security situation, not for security reasons, actually for political reasons. So, if we want to call it market, the Syrian market is free now for Russian companies to come and join and to play an important part in rebuilding Syria and investing in Syria. The most important part for me, and I think for them as well, is the oil field, the oil and gas, and some Russian companies now joined, let’s say, that sector recently during the last few months, and the process of signing the contracts, the final, let’s say, steps of signing the contracts is underway. So, that’s how I look at it." "Actually, if you talk about the relation between the Syrian government and the Russian government, it goes back in history for decades, so they know the details of Syria, and after the war they know more details about what’s happening. So, if we want to talk about fighting terrorism, we discussed in details the requirements to support the Syrian Army. For this stage, the Russian support by air raids was enough for the Syrian Army to advance on different fronts, mainly in Aleppo and Palmyra as you know. I’m sure that if the Syrian and the Russian officials and military officials feel that we need more support to defeat the terrorists, they’re going to do it, but till this moment, the level of support is good and effective." From President Assad's Statements to Russian Media, March 20, 2017. "Of course, it’s not only Syrian heritage; it’s international heritage, and I think the whole world should be worried about the destruction of Palmyra. Of course, some of the destruction could be repaired. Now we are evaluating, because you know if the stones turn into rubble, it could be difficult for anyone to restore this heritage, but if you have the stone safe and sound, you can do it. When we liberated Palmyra the first time, President Putin himself, when he spoke to me and congratulated me for the liberation of Palmyra last year, he said Russia was very interested in the restoration of Palmyra. Of course, as you know, ISIS came again to Palmyra, and it was liberated again, but now there’s more destruction, so we have to re-evaluate Palmyra again to see what we can do, but I think it’s not only about Syria and Russia; it’s about the UNESCO, it’s about the other institutions, and it’s about other countries that they always claim that they are worried about the human heritage and human culture and so on." "As we heard this morning, that the Russian Ministry of Foreign Affairs asked the Israeli ambassador, they invited him to the Ministry in order to discuss the Israeli violation of the Syrian sovereignty. So, I think Russia can play an important role in that regard, and the whole policy of Russia is based on the international law, it’s based on the Charter of the United Nations, and the Security Council resolutions. So, they can discuss the same issues with the Israelis depending on this criteria, and they can play a role in order that Israel not attack Syria again in the future." "Let’s talk about the reality, about the facts; since the Russians started their raids against ISIS in cooperation with the Syrian Army – of course after we asked them to come and support us in our fight against the terrorists – ISIS has been shrinking. Before that, there was what they called American alliance or the Western alliance against ISIS, which is a cosmetic alliance, ISIS was expanding. So, they started talking about the Russian role in that negative way only after they started succeeding on the ground. But first of all, in reality, Russia succeeded with the Syrian Army in fighting the terrorists, and the recapture of Aleppo and Palmyra recently and many other areas is the concrete evidence, so we don’t have to talk about opinions; it’s a fact. Regarding the political relation with the government, since the beginning of this – not only intervention; the support, before sending their troops to Syria, I’m talking about the beginning of the war six years ago – since that time, every political step and later military step that has been taken regarding the Syrian issue was in consultation with the Syrian government. This is their policy, and this is their behavior. Their policy and their relation with Syria are based on two things: first of all, the sovereignty of Syria, which is part of the Charter of the United Nations, and the sovereignty of any country. The second one is on morals, based on morals, that’s why there’s no colonization, there’s relation that goes back to more than six decades between Syria and Russia, and it has always been like that in different circumstances." "So, the question is: how can they cooperate, and I think the Russians have hope that the two parties join the Russians and the Syrians in their fight against terrorism. So, we have more hopes now regarding the American party because of the new administration, while in Turkey nothing has changed in that regard. ISIS in the north have only one route of supply, it’s through Turkey, and they’re still alive and they’re still active and they’re still resisting different kinds of waves of attacks, because of the Turkish support." " It is essential. Any cooperation in any conflict around the world, it needs the, let’s say, the rapprochement, between the Russians and the Americans. It’s very essential, not only for Syria." "There’s direct contact between them, and President Putin had a telephone call with President Trump a week or so, and they talked about different issues including Syria, so they don’t need my role to do so, and we don’t have any contact with the Americans to help the Russians make contact or improve their relation. We’re not in that position." " We invited the Russians, and the Russians were genuine regarding this issue. If the Americans are genuine, of course they are welcome, like any other country that wants to defeat and to fight with the terrorists. Of course, with no hesitation we can say that." "Troops is part of the cooperation. Again, let’s go back to the comprehensive, you cannot talk about sending troops if you’re not genuine, if you don’t have a clear political position toward not only the terrorism; toward the sovereignty of Syria, toward the unity of Syria. All these factors would lead to trust, where you can send your troops. That’s what happened with the Russians; they didn’t only send their troops. First of all, there’s a clear political position regarding those factors. This is where the Russians could come and succeed in fighting the terrorists in Syria." "The role of Russia, in Syria as well as in the international stage, in the face of the Western schemes to exert hegemony on the states which are committed to their sovereignty and defense of their peoples' interests is pivotal"
From H.E. President Assad's statements upon receiving a Russian Parliamentarian delegation chaired by MP Dmitry Sablin, February 8, 2017. "Yeah, if you want to talk realistically, because the Syrian problem is not isolated, it’s not only Syrian-Syrian; actually, the biggest part… or let’s say the major part of the Syrian conflict is regional and international. The simplest part that you can deal with is the Syrian-Syrian part. The regional and the international part depends mainly on the relation between the United States and Russia. What he announced yesterday was very promising, if there’s a genuine approach or initiative toward improving the relation between the United States and Russia, that will affect every problem in the world, including Syria. So, I would say yes, we think that’s positive, regarding the Syrian conflict." From President Assad's Statements to French Media, January 8, 2017. "Russia through its backing to Syria does defend the security of the Syrians as much as defending the security of its people and of the Europeans too,"
From President Assad's statements to a Russian and EU MPs delegation, December 29, 2016. In answers to questions by the members of the delegation, President Assad pointed out that "the delegation visit, given the delegation members as including several MPs from European Parties and from Russia, is an important signal that Russia and European Countries have shared interests,"
"Let’s say we are more optimistic with caution, because we don’t know what is the policy that he’s going to adopt regarding our region in general, how can he deal with the different lobbies in the United States that oppose any solution in Syria and any good relations with Russia. But we can say part of the optimism could be related to better relation between the United States and Russia, not the West and Russia; because Europe doesn’t exist on the political map. I’m talking about only the United States. If there’s good relation between these two great powers, most of the world, including small countries like Syria, will be the beneficiary of this relation. In that regard, we can say there will be a solution in Syria. At the same time, he said – Mr. Trump, during his campaign – that his priority is fighting terrorism, and we believe that this is the beginning of the solution, if he can implement what he announced." From President Assad's statements to the Italian TG5 channel, December 29, 2016. "Russia is very important, Iran is very important, Hezbollah is very important. All of them are important. Each one made important achievements against the terrorists in Syria, so it’s difficult to say who is more important than the other." "No, first of all, we are fully free, not partially, fully free, in everything related to the future of Syria. Second, which is more important or as important as the first part or the first factor, that the Russians always base their policies on values, and these values are the sovereignty of other countries, the international law, respecting other people, other cultures, so they don’t interfere in whatever is related to the future of Syria or the Syrian people." "I mean, fighting the terrorists in Syria is not only in the interest of Syria or the Syrian people; in the interest of the Middle East, of Europe itself – something that many officials in the West don’t see or don’t realize or don’t acknowledge – and in the interest of the Russian people, because they have been facing terrorists for decades now. So, the Russians are fighting for us, for the world, and for their self." "Today, there is a meeting on the level of the Syrian and Russian military leadership to discuss how to address this emergency situation. In the end, as we liberated Palmyra in the past, we will liberate it again. It was under ISIS control and the Syrian Army, with Russian support, liberated it. We will do that again. This is war: you win somewhere and lose somewhere else. But we should know that the main thrust now, and the priority, is the city of Aleppo." "And I tell you clearly and simply that the Syrian people will not accept any company coming from any state that took a hostile position towards Syria or towards the integrity of Syrian territory or a state that supported terrorists. This is very clear, and we need to be able to distinguish between the private sector in such states and the position of the states themselves. The priority in this case will be given to friendly countries which supported us directly like Russia, China, Iran, and others, or at least the countries which did not stand against Syria, even when they were neutral and took a moral position." "Had our Russian friends found that we are involved in this war for causes related to the President, the government, a group, or a special agenda, I tell you that they would have advised us and maybe put pressure on us. But they know, as we do, that the issue has to do with war against terrorism. Our Russian friends, who know the implications and dangers of the spread of terrorism, would not advise us to move in the direction favored by the West. On the other hand, we have dealt with Russian officials at different levels and in different sectors for about six years. Add to that a relation which dates back six decades. It has never happened in the history of this relationship up to this interview that the Russians tried to put pressure on us in relation to an issue they consider part of Syrian sovereignty. When they want to offer an opinion or an advice, they always say: in the end this is country and you identify the right decision and the decision that suits you. So, the nature of the Russian state does not favor pressure; and the policy we have adopted in Syria also goes in the right and mutually-agreed direction which achieves our common interest." "I would like to thank you and to express my pleasure for meeting you in Damascus, and to send my regards through you not only to the Russian leadership but to the whole of the Russian people; for all the support provided by Russia to Syria on the political level, through the Security Council, or on the international arena in general, or through the direct military support was all thanks to the Russian people who we consider a direct participant in this war against terrorism. Regardless of the extent of political, military, or material support, there is something which is much more precious which is blood. We will never forget that in addition to the Syrian-Russian families which have been created throughout the past sixty years, during this war there was also joint blood through the martyrs offered by Russia in defense of Syria and the Syrian people in the face of terrorism. That’s why I send my regards to every Russian citizen throughout the very large Russian arena." "As for Russia, we have dealt with many Russians recently, in addition to our knowledge of them for decades, through the relationship with the Soviet Union and then with Russia. In the different circumstances this relationship has undergone – circumstances that have brought radical changes – not once the Russians tried to impose anything on us, even when there were differences, including Syria’s role in Lebanon. Despite our differences with the Soviet Union at that time, they did not try to impose certain decisions on us although we used to depend greatly on them, particularly when it comes to weapons." President Assad's Interview with Al-Watan Daily, December 7, 2016. "Today, the same applies to the Russian Federation. It is not merely a style adopted by the President or the Russian leadership. It is a form of popular culture for them. When we meet on all levels, and in all sectors, they have one culture based on morality. They have self-respect and they respect sovereignty. That’s why the Russian policy today is based on principles, because these principles constitute an existing popular and cultural condition." "When they say that they emphasize Security Council resolutions, state sovereignty, respect for others, respect for the will of the Syrian people, or any other people, they reflect their culture and apply it on a daily and continuous manner. That’s why I can confirm that they haven’t carried out one simple or complicated, major or important step, regardless of the labels, except in consultation with Syria. Of course, most of these consultations are not public. And because the game today is an international one between the West which wants to undermine and embarrass Russia, on the one hand, and Russia and its allies on the other, Russia announces a certain step or agreement. This might appear to some people as if Russia makes the decisions, but reality is different and our relationship is based on self-respect. Of course, now they are fighting, with us, a real battle against terrorism, and in this case we are partners, and we cannot say that decisions are purely Syrian, and that the Russians have nothing to do with them. This is illogical. There are consultations on a daily basis, and there is agreement and disagreement, but ultimately we agree on one decision and take one decision." "Absolutely not. They haven’t asked for anything. On the contrary, we want to strengthen these ties and have called, before the crisis, and after the crisis, for Russian investment in Syria. In return, they haven’t tried to take advantage of this condition at all. As we said, principles are essential for their policies. At the same time, the war on terrorism is not fought only for Syria. It is a war for Russia, for Europe, the region, and the whole world. The Russians are aware of this on the political and popular levels. That’s why if we talk about principles, they are based on principles, and if we talk about interests, there are also common interests between the two countries. They have said this publicly. “We are defending the Russian people by preventing terrorism from reaching Russia.” They said this on more than one occasion." "The stances and policies taken by Russia at the international level and as regards the war of terrorism against Syria have indeed proved the natural position of Russia as a great power based on principles, values , commitment to international law and the respect for states' sovereignty and right to self-determination." From President Assad's statements, November 22,2016. "the importance of the Russian support for Syria is in all fields, particularly in the economic field which concretely contributed to reduce the Syrians' sufferings, caused by the war of terrorism and the for years unjust imposed economic sanction." "…first of all, we are fully free, not partially, fully free, in everything related to the future of Syria. Second, which is more important or as important as the first part or the first factor, that the Russians always base their policies on values, and these values are the sovereignty of other countries, the international law, respecting other people, other cultures, so they don’t interfere in whatever is related to the future of Syria or the Syrian people." "…fighting the terrorists in Syria is not only in the interest of Syria or the Syrian people; in the interest of the Middle East, of Europe itself – something that many officials in the West don’t see or don’t realize or don’t acknowledge – and in the interest of the Russian people, because they have been facing terrorists for decades now. So, the Russians are fighting for us, for the world, and for their self." "We hope, but in reality, no, for a simple reason: because the Russians based their politics on values, beside their interest. The values are that they adopt the international law, they fight terrorism, and the interest that if you have terrorists prevailing in our region, that will affect not only our region but Europe, Russia, and the rest of the world. So, the Russians are very serious and very determined to continue fighting the terrorists, while the Americans based their politics on a different value, completely different value, their value is that “we can use the terrorists.” I mean the Americans, they wanted to use the terrorists as a card to play the political game to serve their own interests at the expense of the interests of other countries in the world." "Let’s talk about the reality. Before the Russian interference, ISIS was expanding, as I said. When they started interfering, ISIS and al-Nusra and the other Al Qaeda affiliated groups started shrinking. So, this is the reality. Why? Of course, because it’s a great power and they have great army and they have great firepower that could support the Syrian Army in its war. The other side of the same story is that when a great country, a great power, like Russia, intervene against the terrorists, in coordination with the troops on the ground, and in our case, it’s the Syrian Army, of course you’re going to achieve concrete results, while if you talk about the American alliance, which is not serious anyway, but at the same time they don’t have allies on the ground, they cannot achieve anything. So, the Russian power was very important beside their political weight on the international arena, in both ways they could change the situation, and they were very important for Syria in defeating the terrorists in different areas on the Syrian arena or battlefield." "No, it’s not on my side. It’s on the international law’s side. It’s on the other side which is opposite to the terrorists’ side. This is the position of Russia, because they wanted to make sure that the international law prevails, not the Western agenda in toppling every government that doesn’t fit with their agendas. They wanted to make sure that the terrorism doesn’t prevail in that area, that would affect negatively the Russians themselves, Russia itself as a country, and Europe and the rest of the world. 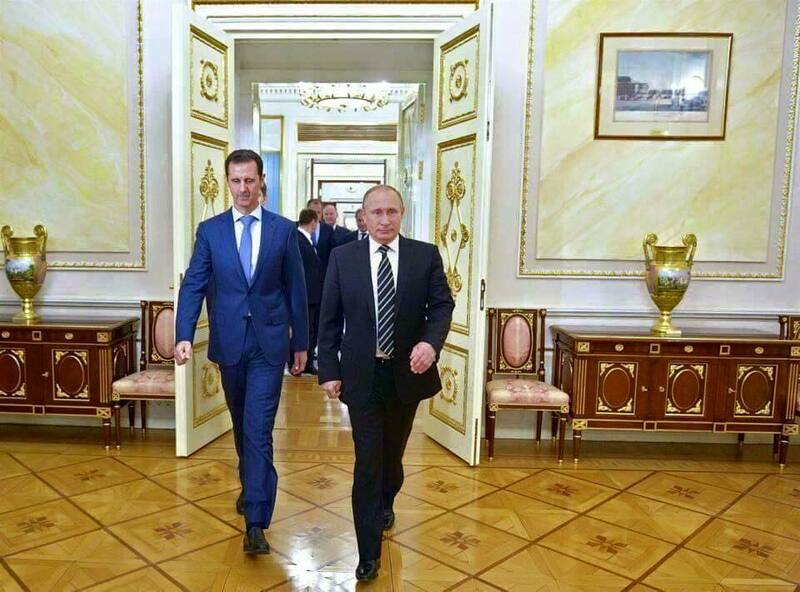 That’s what it means for Russia to stand beside the legitimate Syrian government and the Syrian people." "The West, for them, Syria and Russia are allies for decades now, and again, if we undermine the position of Syria, we can influence the Russians negatively. But there’s something else; it’s about the historical role of Syria. Syria has played that role in the region for centuries, it was always the hub of the geopolitical dynamic in the Middle East. So, controlling Syria – since the Pharaohs, before the Christ, they used to fight for Syria, the Pharaohs and the Hittites, this is historical basis. So, it has a role, geopolitics, the position on the Mediterranean, the society, because Syria is the fault line between the different cultures in this region; whatever happens in Syria will influence the region, negatively and positively, so controlling Syria is very important. Although Syria is small, it’s very important to control the rest of the region. Second, Syria is an independent country, and the West doesn’t accept any independent country, whether Syria as a small country, or Russia as a great power. What’s their problem with Russia? Because you say “yes” and “no. You have to keep saying “yes.” That’s the problem with the West. So, that’s why Syria." From President Assad's Interview with NBC News, July 14, 2016. From President Assad's Interview with the Australian SBS TV, July 1, 2016. "The noble stances of the Federal Republic of Russia and its commendable help for the Syrian People as to encounter terrorism are but the normal non-stop merits of the Russian People in encountering oppressions, aggressions standing by the just causes of the people,"
From H.E. President Assad's congratulatory cable to President Putin, May 5, 2016. "The Russian People paid a very high cost- defeating Nazism- but recorded in the history the legend of steadfastness and victory as to inspire generations throughout ages." "The Syrian City of Aleppo today, like all Syrian cities, embraces the hero Stalingrad with a pledge as to accept nothing less than defeating this aggression achieving ultimate victory in the interest of Syria, the region and the world, though of the fierce aggression and of the barbarity of aggressors, not to mention the bulk of sacrifices and sufferings,"
" I’m talking about Russia. There are no other states, because our relations with Russia are more than six decades old, and they are based on trust and clarity. Moreover, it is the case because Russia bases its policies on principles, and we base our policies on principles. That’s why when there are Russian military bases in Syria, they do not constitute an occupation. On the contrary, they strengthen our relations and our friendship, and they strengthen security and safety, and this is what we want." From President Assad's Interview with Russia’s RIA Novosti and Sputnik, March 30-31, 2016. "Had President Putin decided to send his forces to support the terrorists, they would have applauded him. This is the problem with Western countries. The problem for them is not having a Russian base in this period." "There is also another issue: they don’t want a Russian presence on the international arena, neither politically, nor militarily, nor economically. So, any action taken by the Russian state and Russia, in its real position as a first-class superpower, and not a second-class one, as the Americans want Russia to be, any such act will annoy the West in general. This is why they are annoyed. As to keeping the Russian forces in Syria, as I said before, this is linked to the issue of fighting terrorism, and later to the geopolitical condition in the world." "That visit was conducted in special circumstances. It came a little less than two weeks before the beginning of the Russian support to Syrian forces. So, there’s no doubt that this imposed itself on the visit’s agenda. That was the main subject and the joint vision between President Putin and me about the next stage of fighting terrorism and political action. The visit concentrated solely on these two subjects. There were no agreements, just consultations and dialogue. We focused on two points: first, the military operation which started at that time, and the necessity to strike terrorism. The second point was how to use the military operation in support of the political process. President Putin’s questions were about the same points you raised a short while ago, about our perception of the political process which might start in Geneva or in any other place at that time. These were the only subjects we discussed during that visit." "First of all, I would like to thank you for visiting Syria in these particular circumstances; and I would like to say that I can convey, through your important media organization, the thanks of every Syrian citizen to every Russian citizen for the support extended by Russia to Syria during the crisis, whether the support was moral, humanitarian, or recently military. Every Russian citizen was a main supporter for President Putin in taking such a decision. Today, despite these difficult circumstances, we experience the joy of reclaiming the city of Palmyra which is part of the human heritage of the whole world. We believe that in addition to the Syrian Army, which was determined to reclaim it, Russia had a major role, in addition to Iran and the other forces fighting with Syria. Once again, I would like to thank every Russian citizen, through you, and to say that the relations we have built over a period of 60 years have become stronger and more solid. And we have a great hope for the Russian role on the global arena, and not only in Syria, in fighting terrorism and restoring balance to global politics. Thank you for coming." "Definitely the Russian and the Iranian support were essential for our army to make this advancement." "We don’t have any evidence that the Russians attacked any civilian targets. They are very precise in their targets, they always everyday attack the bases or the targets of the terrorists. Actually, it’s the Americans who did this, who killed many civilians in the northeastern part of Syria, not the Russians. I mean, not a single incident happened regarding the civilians so far, because they don’t attack in the cities; they attack actually mainly in the rural areas." "If we look at Russian policies and Russian officials in the same way we look at unprincipled Western officials and policies, this is a possibility. But the fact is the exact opposite, for a simple reason: the Russians treat us with great respect. They do not treat us as a superpower dealing with a minor state, but as a sovereign state dealing with a sovereign state. That’s why this issue has not been raised at all in any shape or form." From H.E. President Assad's AFP Interview, February 12, 2016. "Having military bases for any country in Syria does not mean that Syria will become a satellite state to these countries. They do not interfere in issues related to the law, the constitution, nor to politics. In any case, the Russian base exists already, while the Iranians have not asked to have one. But in principle, we do not have a problem." H. E. President Bashar Al-Assad, January 12, 2015. From H.E. 's Spanish News Agency EFE Interview, December 11, 2015. "ISIS and al-Nusra and other like-minded organizations or groups, were expanding, expanding freely. What was the situation after the Russians participated in fighting terrorism directly? ISIS and al-Nusra started shrinking. So I would say, first they will not give any results. Second, it will be harmful and illegal, and it will support terrorism as what happened after the coalition started its operation a year or so, because this is like a cancer. You cannot cut the cancer. You have to extract it. This kind of operation is like cutting the cancer that will make it spread in the body faster." From H.E. President Bashar Assad's Sunday Times Interview, December 6, 2015. "Look at the Russians, when they wanted to make this alliance against terrorism, the first thing they did was they started discussions with the Syrian government before anyone else. Then they started discussing the same issue with other governments. Then they came. So, this is the legal way to combat any terrorist around the world." "The Russian role is very important. It has had a significant impact on both the military and political arena in Syria. But to say that without this role, the government or the state would have collapsed, is hypothetical. Since the very beginning of the conflict in Syria, there were bets on the collapse of the government. First it was a few weeks, then it was a few months and then a few years. Every time it was the same wishful thinking. What is definite is that the Russian support to the Syrian people and government from the very beginning, along with the strong and staunch support of Iran, has played a very important part in the steadfastness of the Syrian state in the fight against terrorism." "You will have to ask the Russians why they got involved. But from our perspective, since the Western coalition started in Syria, ISIS has expanded, al-Nusra has expanded and every other extremist and terrorist group has expanded and captured new territory in Syria and Iraq. The Russians clearly saw how this posed a threat to Syria, Iraq and the region in general, as well as to Russia and the rest of the world. We can see this as a reality in Europe today. If you read and analyze what happened in Paris recently and at Charlie Hebdo, rather than view them as separate incidences, you will realize something very important. How many extremists cells now exist in Europe? How many extremists did you export from Europe to Syria? This is where the danger lies. The danger is in the incubator. The Russians can see this very clearly. They want to protect Syria, Iraq, the region, themselves and even Europe. I am not exaggerating by saying they are protecting Europe today." "Again, this was started at the lower levels. These officials jointly agreed that it was necessary to get involved and each party discussed it with their leaders. When it reached the stage of discussion between us, I mean between President Putin and I, we focused our discussions on the how. Of course this did not happen directly as we had not yet met and it’s impossible to discuss these issues on the phone. It was mediated through senior officials from both sides. That is what happened. In terms of procedure, I sent a letter to President Putin which included an invitation for their forces to participate." "Exactly, after we reached that point I sent President Putin a formal letter and we released a statement announcing that we had invited them to join our efforts. Let’s not forget that President Putin had already taken the step when he said he was willing to create a coalition. My response to this was that we are ready if you want to bring your forces to participate." "We have not discussed that yet, and I don’t think we need it now, because things are moving in the right direction. The Russians may consider it with time or under different circumstances, but for the moment, this has not been discussed." "Now definitely the Russian participation, or what was announced as a front against terrorism, is the most important one. This is the practical thing against terrorism, while in Paris what happened on the political level is just to assuage the feelings of the French, like saying the French are going to attack ISIS in a very different way. What does that mean? Was not France serious before the attack on Paris? So, they are going to only assuage the feelings of the French, nothing serious, while the Russians are very serious in fighting terrorism and there is cooperation between them and the Syrian army." "While since the participation of the Russians in the same so-called fight against terrorism, ISIS has been shrinking and Al Nusra of course and other terrorist groups. So, this is reality. The facts are telling." "The war against terrorism is continuing. The Russian supportive participation is going to be stronger, it is strong anyway, and I think there is no way back on that regard, whether he does it again, this way or another way." "In appearance, Russia supported the government because they support the international law and the stability in the region, their stability and the stability of the whole region and world." "Let’s make this comparison through the facts; before the Russian participation started about two months ago, it had been more than a year the American – what they call “American alliance” – started their campaign against the terrorists, but the result is that the terrorists have gained more ground and more recruits from around the world. During the first month of the Russian participation, the same terrorists groups have been retreating and fleeing Syria in thousands to Turkey then to other countries; some to Europe, some to Yemen, and other areas. So, this is the fact." "You know now Russia is leading the political activity regarding Syria in the world, and my visit was about two weeks or three weeks before the Vienna conference. That’s why I had that visit; in order to see what the horizon is in the political field regarding this crisis, what could be done. Now, Vienna defined some of the headlines which is general terms of course." From H. E. President Bashar Al-Assad's interview with Italian TV channel RAI UNO, November 18, 2015. From H.E. 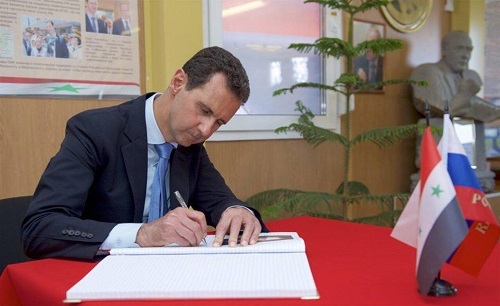 President Bashar Assad's statements in Moscow, October 20, 2015. "First of all, I want to express our tremendous gratitude to the Russian leadership and people for the help they are providing Syria. Thank you for supporting Syria’s unity and independence. Most important of all is that this is being done within the framework of international law." "I must say that the political steps the Russian Federation has been taking since the start of the crisis made it possible to prevent events in Syria from taking an even more tragic turn. If it were not for your actions and decisions, the terrorism that is spreading through the region now would have made even greater gains and spread to even wider territories. You have confirmed your course of action by joining in the military operations as part of a common front in the fight against terrorism." "We must be particularly aware that military strikes against the terrorists are essential above all because we must fight terrorism, and also because terrorism is a real obstacle on the road to reaching a political settlement. Of course, the entire nation wants to take part in deciding the country’s fate, and not just the government." "I want to thank the Russian people once more for the help you are giving Syria and express the hope that we will vanquish terrorism and continue working together to rebuild our country economically and politically and ensure peaceful life for everyone." "What’s happening in Syria, in this regard, is similar to what happened in your case. Notice what happened in the Western media since the coup in Ukraine. What happened? President Putin was transformed from a friend of the West to a foe and, yet again, he was characterized as a tsar. He is portrayed as a dictator suppressing opposition in Russia, and that he came to power through undemocratic means, despite the fact that he was elected in democratic elections, and the West itself acknowledged that the elections were democratic. Now, it is no longer democratic. This is Western propaganda. They say that if the president went things will get better. What does that mean, practically? For the West, it means that as long as you are there, we will continue to support terrorism, because the Western principle followed now in Syria and Russia and other countries is changing presidents, changing states, or what they call bringing regimes down. Why? Because they do not accept partners and do not accept independent states. What is their problem with Russia? What is their problem with Syria? " From President Bashar Al-Assad's Russian Media Interview, September 16, 2015. From President Bashar Al-Assad's statements on March 6, 2014. "Therefore, alongside the Russian experts, we submitted all the details and indications to Russia. The evidence confirmed that the attack was perpetrated by the terrorists in Northern Syria." From President Bashar Al-Assad's Interview with Rossiya 24 TV channel, September 12, 2013. "We are fighting terrorism. We are implementing our constitution by protecting the Syrian people. Let’s go back to what happened in Russia more than a decade ago when you faced terrorism in Chechnya and other places; they attacked people in theaters and schools and so on, and the army in Russia protected the people, would you call it war crimes?! No, you would not. Two days ago, Amnesty International recognized the crimes that were committed few days ago by the armed groups when they captured soldiers and executed them. Also Human Rights Watch recognized this. Human Rights Watch recognized more than once the crimes of those terrorist groups and few days ago it described these crimes as war crimes, this is the first point." From President Bashar Al-Assad's RT TV Interview , November 9 , 2012. "Syria is counting on Russia, primarily because of the historic relations between the two countries and because Russia is a superpower and a permanent Security Council member,"
From H.E. President Assad's Russian TV Interview, October 30, 2011. "Russia has played an important role since the first days of the crisis and that the two governments were communicating directly, with the Syrian government explaining to Russia the details of the situation based on Syria's importance and influence in terms of the situation in the Middle East and the region." "Russia knew the dangers of the attempts at foreign interference in Syria, thus Russia played an important role in the international arena, with the most recent action in this regard being the Russian veto at the Security Council,"
"Syria is counting on the Russian stance and continuing support not just in defense of Syria, but also in defense of worldwide stability….any Syrian citizen would have the same response as anyone with the least amount of patriotism would be grateful for Russia's stance at the Security Council,"
"Regarding the burning of flags, I don't believe we can put that in the frame of political work as it doesn't represent opposition or anything else. It often represents individual cases that may be spurred from abroad to complete the media image of the big lie being promoted about Syria in foreign media, showing Russia as if it supports a state against the people… this is the supposed media game behind this action,"
"Syria, Russia, India and China are east. There are many countries that have good relations with Syria whether in the east, in Latin America or in Asia. There are rising powers In Asia, such as, India, China and Russia which are playing an important worldwide role in the political, economic and technical fields. The west is not the only choice we have, and we must take advantage of our relations with these countries. 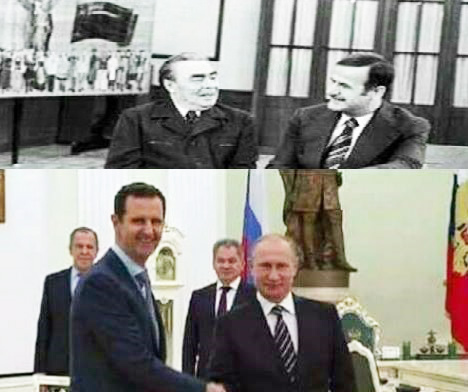 Syrian-Russian relations, for example, were improved in rapid paces after 2005 when we decided to head eastwards. I think this crisis will further boost these relations, especially in the economic domain. We count on our relation with Russia and the Russian aid in the political aspects and the Russian-Syrian economic cooperation." "This visit will be an important and historical milestone on the road to promote the bilateral relations in which the cultural communication has played a major role in consolidating it throughout hundreds of years." From H.E. President Bashar Assad's Statements during President Medvedev visit, May 10-11, 2010. "the policy of supporting the just struggle of third-world peoples for liberation and independence played by Russia during the Soviet Union era and nowadays has sustained its highly-valued position by the peoples of the Middle East." "The Syrians will not forget Russia's support to Syria to liberate the Occupied Syrian Golan and all occupied Arab territories and its continuous pursuit to achieve a just and comprehensive peace in the region." "Syria plays an important role in the Middle East, something very important for world security. Russia is an important country due to its geo-political position as a country that connects between the East and the West, its human, economic and scientific potentials and its position at the UN Security Council." "Therefore dialogue between us is always important for the region and the world. At the same time it is always a fruitful and productive dialogue. That is how the situation was today during my discussion with President Medvedev,"
"We focused in our talks on bilateral relations. There is always continued and organized coordination between the two countries. Today we gave wide space for talking about activating cooperation in the economic domain. The world financial crisis has generally harmed cooperation among world countries. Trade exchange between Syria and Russia has been affected by this crisis. Today we are thinking of the new horizons which may help boosting cooperation between the two countries as to overcome it and lead this cooperation to new prospects,"
"We discussed dam construction and irrigation infrastructure in addition to transport specially air transport and potentials of setting up a strategic cooperation council between the two countries. Foreign Ministries in both countries will study this issue and submit proposals to the two governments and leaderships." "The peace process issue was on the table. Both countries are traditionally concerned in achieving peace in the Middle East. Russia is one of the main sponsors of the ME peace process launched in Madrid. This process is now at a standstill but during the standstill period, it is possible that some parties carry out procedures that may help boost peace opportunities and vice versa, they may carry out procedures that may completely blow up the peace process, "
"We tackled the Iranian nuclear issue. Our views were that all countries have right to possess peaceful nuclear power, and the necessity to free the Middle East from all mass destruction weapons. We stressed that dialogue between Iran and the 6-countries group; because sanctions have no effects. They rather complicate solution instead of easing it,"
" We condemned all terrorist operations recently carried out against the friendly Russian people, who seek peace. We stand by this people in confronting any action that may harm their safety and interest." '' I start from the role of Russia: First, Russia is one of the main sponsors of the peace process launched in Madrid conference; Madrid Terms of Reference are still valid till today for the peace process; this does not contradict other present terms of reference in the Arab Peace Initiative. All these terms of references are basically rooted in the UN Security Council resolutions." "We, in Syria, are very keen on the historic and strategic relations between Syria and Russia- Former Soviet Union- , which have always worked for security, and peace in the world,"
"There are many issues to be dealt with during our meeting today- August 21st 2008- on top of which stands the situation in the Middle East and the recent crisis in Caucasus,"
" We comprehend the Russian stance and the Russian military response to the provocation; we appreciate the courageous decision taken by the Russian Leadership in responding to the international initiatives starting to withdraw its troops." " Russia has always been supportive of the Peace Process , and we are to deal with the active role that Russia might play in this regard." " We stand against all such bids; hence, for us, this is a continuation for the US policy since Cold War era. What Russia has taken of measures- regarding Caucasus crisis- is but the defense of its legitimate interests." "Naturally, the issue of military cooperation is a fundamental one. The buying of weapons is very important though of some bureaucratic obstacles at times, whether for production reasons or for financial difficulties. There is a need to speed matters knowing that the US and Israel have always been exerting pressures on both Russia and Syria." "We are aware of the wide scope of Israel influence in Georgia ; the reports of closeness between the US and Israel is no secret . We hope that Russia were to realize clearly this role played by Israel in Caucasus crisis." " if we were to evaluate the matters objectively, the relations between Iran and Russia are very good; Iran’s Air Defense System is a Russian made one, and is more modern than that which Syria has. Thus, we have to buy such a System from Iran and not the opposite." "Russia has great potentials; therefore Russia has to remain a super power,"
" The traditions of the Syrian Christians and Moslems’ living peacefully together is one of the most important characteristic of our people; we have also a Jewish Community. In Syria live many of the Russians. The most ancient Church exists in Damascus." "We cannot view what happened in the Caucasus apart from other consistent steps of the United States and its allies aimed at weakening Russia and lessening its role on the international arena. The question of human rights, the events in Chechnya and anti-Russian actions of a number or governments that came to power in ex-USSR countries were used for the same purpose in the past,"
"Russia had no other choice in conditions when the rights of its citizens and its own interests were affected and there emerged the threat to stability in the Caucasus,"
"Of course, this economic relationship, even in the field of oil, did not start this decade. It has been there for a long time, but the fact is that what strengthened economic relations between Syria and Russia, in addition to the political relations, is the successful visit which I made to Moscow at the beginning of this year. One of the most important points during that visit was finding a solution to the problem of debt between the two countries that remained unsolved for long decades. Solving this problem opened the doors for economic cooperation in many areas. Signing this contract comes as part of this cooperation. This does not mean that the political relationship does not reflect positively and negatively on any economic relationship between Syria and Russia or between Syria and other countries,"
From H. E. President Assad's Russian TV Interview, December 12, 2005. ‏ ‏"There is no doubt that Syria and Russia are now political allies, and it is natural that in a situation of political alliance benefits and merits are given to the companies in one of these two countries. On the other hand, and this is of course from a Syrian perspective, I do not think that Russia will take a political decision for this contract. There are interests much larger than this contract. As I said earlier, there are interests in the stability of the region and in the role of Syria. You know that there was no stability in this region. Now, particularly after the war on Iraq, which was the last ditch in the region`s stability, any political or military mistake in this region will push the region towards chaos. This will affect the southern borders of the Russian Federation. So, as I said, I believe that the economic dimension, the political dimension, in addition to stability represent the greater part of our relationship with Russia." "Mr. President, this visit is taking place within the historic relations between our countries, which will work to strengthen these relations in all areas, and which have come through the dramatic events of the last two years, which gave even greater stimulus to these relations." From H.E. President Bashar Assad's Statements at the conclusion of Russian-Syrian talks, Moscow, January 25, 2005. "Our talks took place in a very good, friendly atmosphere, and all the issues were discussed that were of mutual interest: regional, international and bilateral. As for our bilateral relations, they should be built on the principles of mutual respect and interest. And an agreement was reached that these relations will be built on mutual benefit. We also reached a solution to a long-standing issue – Syria’s debt to Russia, which will give a stimulus to our economic ties." "There was wide discussion of peaceful regulation in the Middle East, and paths to achieving peace in our region. We stressed that the hindrances that hold up the peace process in the Middle East will ultimately affect all the countries of this region. And this will further raise the level of violence and undermine the foundations of stability in the region. We stressed the necessity to cooperation in solving the Middle East issue on the basis of the Madrid Convention and UN Security Council resolutions № 242 and 338, and other international resolutions. Plus the principle “peace in exchange for land”, plus the Arab peace initiative that was advanced in Beirut in 2002. We stressed the necessity to continue talks without any conditions, which could lead to a universal fair solution, the withdrawal of Israeli troops from all Arab lands occupied since 1967, and the creation of a Palestinian state with the capital of Al-Kuds (Jerusalem). We stressed the necessity for the Middle East to be fully cleared of weapons of mass destruction." "As for Iraq, we stressed the necessity to maintain the integrity of Iraq and its national identity, and agreed to support the political process that is currently going on there, including elections – stressing the necessity for all sections of the Iraqi people to take part." "As for the international situation, we agreed that peace should be more active, and that other countries should work more actively in this field, and support the role of the UN for maintaining peace all over the world. At the same time, we believe that the UN requires reform to all its structures." "We discussed terrorism and are prepared to fight it. We have the same opinion about where the root of this disease lies, and how to treat it." "We express our support of Mr. Putin’s policies, which support the active presence of Russia on the world stage. We also thank Russia for supporting our just rights."